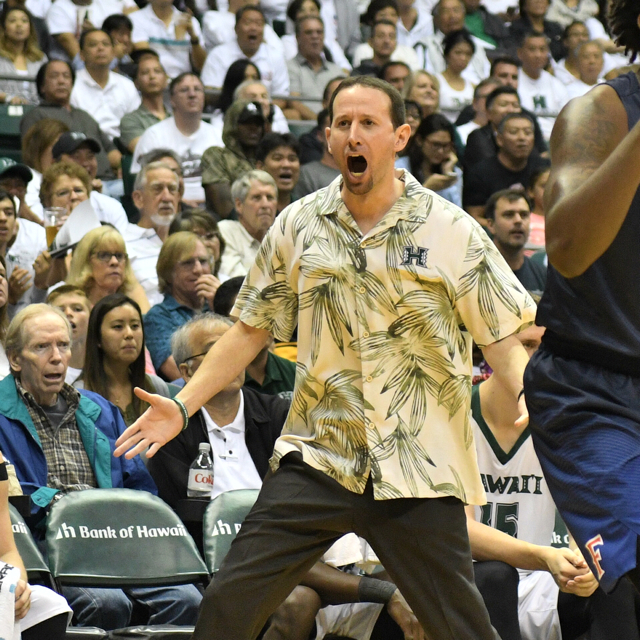 One half of basketball has suddenly raised a bit of concern for the University of Hawai’i basketball team. 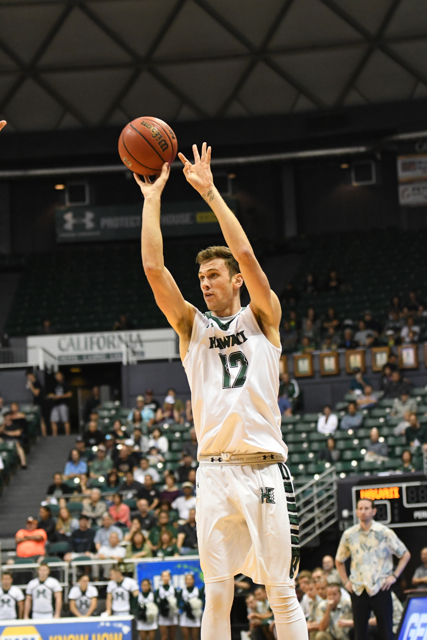 After maintaining control for the entire first half, the Rainbow Warriors sputtered and eventually crashed in a 78-64 road loss at Cal Poly. A crowd of 2,703 at Mott Athletics Center in San Luis Obispo, Calif., watched the Mustangs out-score the Warriors 50-29 in the second half. Less than a month ago, Hawai’i held this same Cal Poly team to 45 points for the entire game in a 57-45 win in Honolulu. The Warriors lost their third consecutive game to drop to 13-8 overall and 4-4 in the conference. They are now in sixth place, just eight days after being alone in first place. Cal Poly improved to 8-15 and 3-6, and ended a streak of six consecutive losses to Hawai’i. The Mustangs dominated three statistical categories: a 41-24 rebounding advantage, 11 for 16 (68.8 percent) from 3-point range, and 17 for 18 (94.4 percent) on free throws. Sheriff Drammeh led the Warriors with 17 points, including 14 in the first half. Jack Purchase made four 3-pointers and finished with 12 points, and Drew Buggs added 10 points and four assists. Mike Thomas, the team’s leading scorer for the season, finished with seven points and six rebounds. He was limited to 18 minutes due to foul trouble. The game started well enough for the Warriors, who raced to a 5-0 lead to open the contest. Hawai’i led by as many as nine points late in the first half, and took a 35-28 lead at intermission. Then the Mustangs came out firing in the second half. They went on a stunning 16-2 run in the first four minutes of the second half to take a 44-37 lead. The Warriors had an immediate response, going on a 13-4 surge of their own over the ensuing four minutes. Brocke Stepteau’s 3-pointer capped the run and gave the Warriors a 50-48 lead with 12:14 remaining. It was all Cal Poly after that. A 13-0 run gave the Mustangs a 64-54 lead with 5:32 remaining, and the Warriors had no answer in the closing minutes. Hawai’i shot 39.3 percent from the field, including just 31.3 percent (10 for 32) in the second half. The Warriors also had season-lows for free throws made (6) and attempted (7). Donovan Fields led Cal Poly with 15 points. Victor Joseph, Jakub Niziol and Luke Meikle added 12 points each, and those three combined to shoot 8 for 11 from 3-point range. 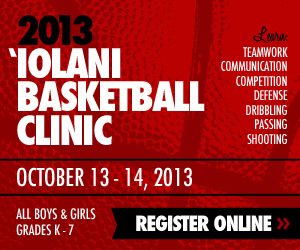 The Warriors are scheduled to return to Honolulu on Sunday, and will play their next two games at home. They will host the two bottom teams in the conference standings – UC Riverside (0-8 Big West) on Wednesday, and CSUN (2-7) on Saturday. UC Riverside at Hawai’i, 7:00 p.m. Embarrassing to lose against one of the worst teams in college basketball. Pathetic, the players should be ashamed. Appears warriors are middle of pack team now. Poly not great athletes. However well coached. With 8 games to go ..bwc going to be wild ride. Lbsu. Davis. Fullerton. Irvine going to be tough games.ucsb leading the charge. Come on Eran get guys ready! typical Bigwest anyone can win it season! makes it fun. I look realistically, at remaining games, unless CSUN(team with good athletes and can be spoiler) same with Riverside(good players and Trap game if they get hot from three land. Fullerton, and Irvine at their house, going be tough, LBSU, they always peak at end of season. 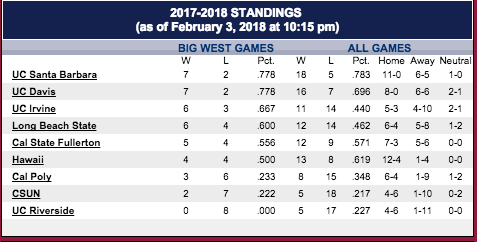 The way BigWest is shaping up, UH could be anywheres finishing 1st win regular season titlle OR 8th last qualifier for tournament. Really exposed UH weakness, when at least 2 bigs for UCSB got their game going and getting those offensive rebounds, UH has to shoot lights, out, great help team defense out to 3 line, and hope the other 9 last games they play , they are not shooting threes well, and they turnover the ball a lot. UH has a very good team, They want to Dominate? this league and go to NCAA or NIT every year? recruit, talent, wherever it might be found. Laura Beeman and her gals, they don’t have the athletes, and the rest of the league is running away from them. we shall see, now in her 5th year going into whether she can recurit, top 300 talent. to Hawaii. Anyways we have been spoiled since 1972, part of eighties, a few teams in the nineties, and that magical run with Eran and staff management, and whomever stuck it out , a miracle 28 win season and first EVER ncaa win! I hop Eran gets there too, consistency over 10 years, maybe that 7500 in house crowd will retrun like before ! Go Bows Warriors ! Very apparent that league athletes, the guards, the bigs, from the top Gauchos to the bottom Mustangs and Highlanders and Matadors, they are starting to play like Big West teams, more defense, inside play, run and gun, and playing with smarts, though at times they are smaller that UH. Eran has to hit that talent athletic pipeline now… otherwise the consistency over next 5 years will wane, hope for the best, Coaching, and Recruiting have to imporve. Otherwise forget the 10300 seat in house attendance like the past. Go Bows. Warriors ! Tale of 2 halves. Warriors looked timid in the second half. They need to win these next two games!! The good news is the two worst teams in the Big West are coming to town this week. UH should have a easy time winning two games this week to get some confidence back. The big and true test will be the following week when we go back on the road. I have a lot to say about this road trip but I’ll try and keep it succinct. Against UCSB, the Warriors played like true Warriors and ended up coming just short. The difference maker in this one, was that Drammeh wasn’t getting any of the calls he usually gets. This messed with him mentally and he just wasn’t where we needed him to be. Nothing against him but this ended up being the deciding factor. Against Cal Poly, the foul disparity was real (18 to 8). Mike Thomas was in foul trouble the entire game…yes, MT has a history of getting into foul trouble but a I found a lot of the calls touch fouls at best, highly suspect and one-sided. Also, announcers for both games were totally cringe-worthy. It was so bad that I had to mute them and turn on Bobby Curran’s radio broadcast. One of the announcer’s at UCSB blurting “TRAVEL!! !”, among other blunders. Totally homer refs, Cal Poly too. After UH forced them into 12 first half turnovers, the announcers were totally down-playing the defense, saying that UH only was responsible for maybe 2 of those? Clueless. In any case, these losses hurt but at least we still have time to learn from this, get back on our feet, refocus and get our heads right. Obviously, if the big west tourney was now I’d be worried, but it’s not for another month. That’s a long time to battle it out and finish near the top. The run starts this Wednesday. Let’s go bows!